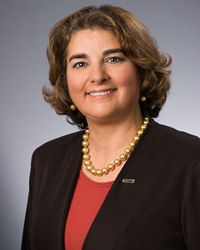 HNTB’s Diana Mendes has been named chair of the American Public Transportation Association Legislative Committee and appointed to APTA’s Executive Committee. I am honored to be elected by APTA’s diverse membership to support the organization’s mission of strengthening and improving public transportation. Diana Mendes, AICP, HNTB Corporation Mid-Atlantic Division president, transit/rail practice leader and senior vice president, has been named chair of the American Public Transportation Association Legislative Committee and appointed to APTA’s Executive Committee. The 2017-2018 slate of officers was voted on during the APTA Annual Meeting in Atlanta on October 7. As president of HNTB’s Mid-Atlantic Division, Mendes oversees six states and the District of Columbia. In her role as national transit/rail practice leader, Mendes is responsible for strategic planning and implementation, industry representation, business development, service delivery and client satisfaction. She is based in the firm’s Arlington, Virginia, office and works with clients across the country.